Directions (6 – 10): In the following passage, there are blanks, each of which has been numbered. These numbers are printed below the passage and against each, five words are suggested, one of which fits the blank appropriately. Find out the appropriate word in each case. __(6)__ a child, the first trip I ever made outside my village was to the library in the next village with my grandfather. A big banyan tree stood near the building with a cement platform under it. My grandfather would go and sit on the platform after __(7)__ me on the first floor. Other village elders would also join him there. I would read the children’s books and be __(8)__ in them until my grandfather called me to go home. 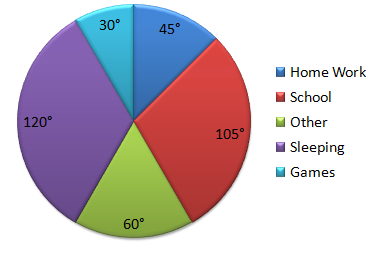 Directions (1 – 5): The following Pie chart shows the hourly distribution (in degrees) of all the major activities of a student. 2. How much time (%) does he spend in games in comparision to sleeping? 4. What is the difference in time (in hours) spent in school and in homework? 6. In how many different ways can the letters of the word ‘REPLACE’ be arranged? 7. A particular sum was divided among A, B and C in the ratio of 2 : 6 : 7. If the amount received by A was 4908. What was the difference between the amounts received by B and C? 8. A car covers a distance of 528km in a certain time at a speed of 66 km/hr. how much distance would a truck cover at an average speed which is 24 km/hr less than the speed of the car in a time which is 7 hours more than that taken by the car? 9. In order to pass in an examination, a student is required to get 342 marks out of the aggregate marks. Neha got 266 marks and was declared failed by 8 percent. 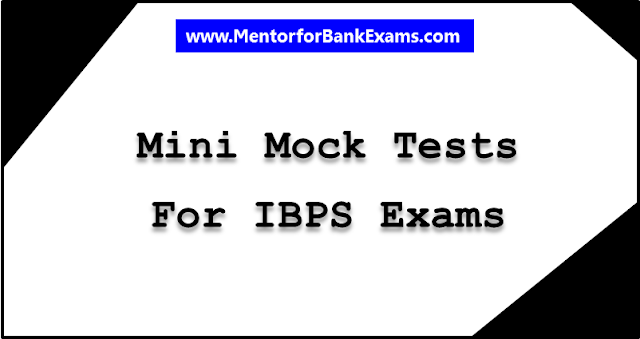 What is the minimum pass percentage of the examination? 10. What should come in place of the question mark (?) in the following number series? Directions (1 – 5): Study the following information given below and answer the following questions. Five Persons; A,B,C,D and E likes different fruits that are Grapes, Watermelon, Cherries, Mango and Banana but not in same order and two of them belongs to same profession and rest each belongs to different profession not in the same pattern. The professions are Accountant, Lecturer, Doctor and Architect. B is neither a Lecturer nor doctor but he likes Cherries. A is neither an Accountant nor an Architect and does not likes Grapes and Water melon. C likes Mango and is a Lecturer. The one who is an Accountant likes Cherries. Architect likes Watermelon. D does not likes Watermelon. 1. Who’s Profession is Lecturer? 2. “E” likes which Fruit? 3. Which two people are in same Profession? 4. What is the profession of B? (1) if the data in Statement I alone are sufficient to answer the question, while the data in Statement II alone are not sufficient to answer the question. (2) if the data in Statement II alone are sufficient to answer the question, while the data in Statement I alone are not sufficient to answer the question. (3) if the data in Statement I alone or in Statement II alone are sufficient to answer the question. (4) if the data in both the Statements I and II together are not sufficient to answer the question. (5) if the data in both the Statements I and II together are necessary to answer the question. 6. How is H related to B? I. H is married to P. P is the mother of T. T is married to D. D is the father of B.
II. B is the daughter of T. T is the sister of N. H is the father of N.
7. Among five persons D, E, F, G and H, each of whom having different height, who is the second tallest? I. D is taller than only G and E. F is not the tallest. II. H is taller than F. G is taller than E but shorter than D.
8. In which direction is J with respect to R? I. R is to the west of P. P is to the south of G. J is to the west of G. When R, P, G and J are joined by straight lines, a square is formed. II. K is to the south of J. H is to the east of K. R is to the north-west of H. When R, K and H are joined by straight lines, a right angled triangle (right angled at K) is formed. 9. What is the position of K from the right end in a row? I. There are even number of students in the row. There are not more than 11 students in the row. II. C stands at the extreme left end of the line. There are five students between C and B. O is third to the right of B. K is not at the extreme end. There is only one student between O and K.
10. On which day of the week(starting from monday and ending on sunday) did Arvind visit Mumbai? I. Arvind visited Mumbai after Monday but before Thursday but not on an odd day of the week. II. Arvind visited Mumbai before Friday but after Monday.